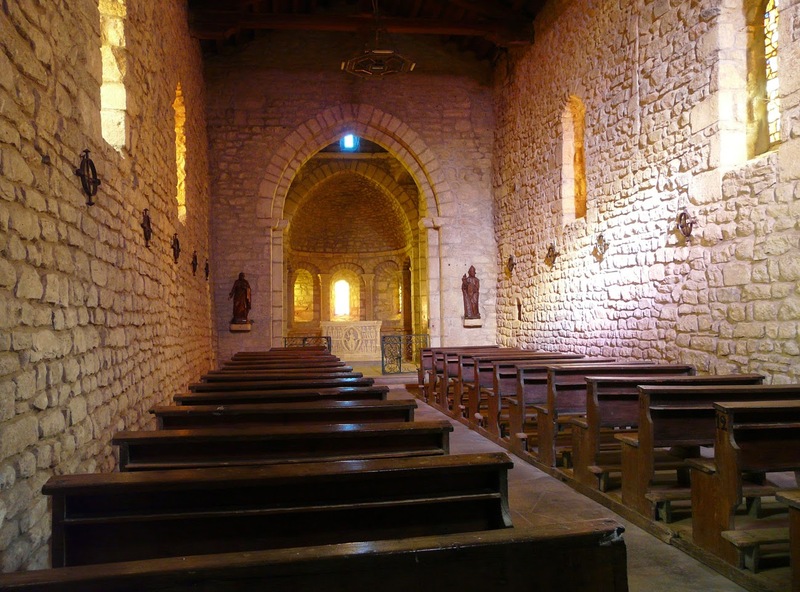 Long before tabernacles for the Reservation of the Most Holy Sacrament came to be placed upon the High altars of Catholic churches, a more common form of Reservation in Western Europe was the Sacrament House. Although taking a variety of forms, the Sacrament House was always one unit, even if it had a number of levels or stages. Church of Saint John Vianney, Houston, Texas. 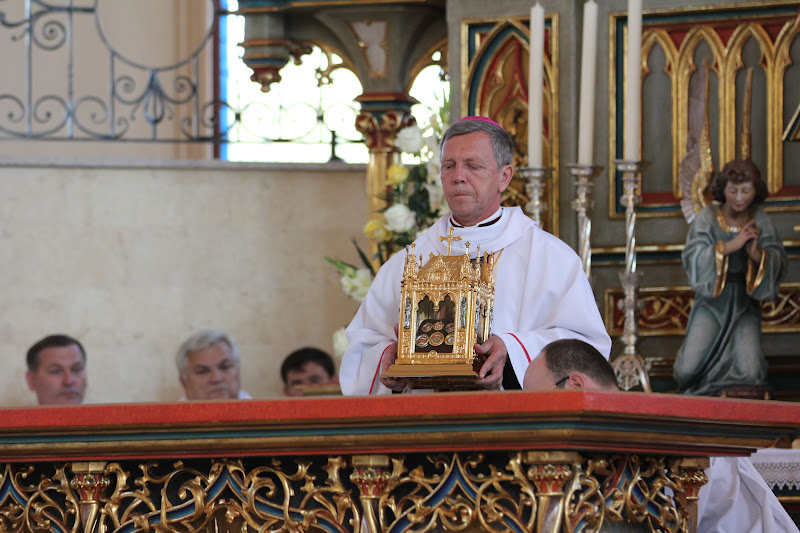 In the last 50 years, however, when the place of Reservation has come to be disassociated with the High altar, we have seen the phenomenon of tabernacles sitting on top of plinths (often freestanding). Some of these are very noble, but they do not have the dignity of the mediaeval Sacrament House. Recently found was the adjacent photograph of the Eucharistic Shrine in the Church of Saint John Vianney in Houston Texas. This is a recently built church, having a skyline reminiscent of mediaeval Italian churches. We see an imaginative treatment of the Shrine of the Blessed Eucharist. A wall is built behind the tabernacle, but separate from it, creating a layered effect. The wall is of stone and resembles the facade of a church. 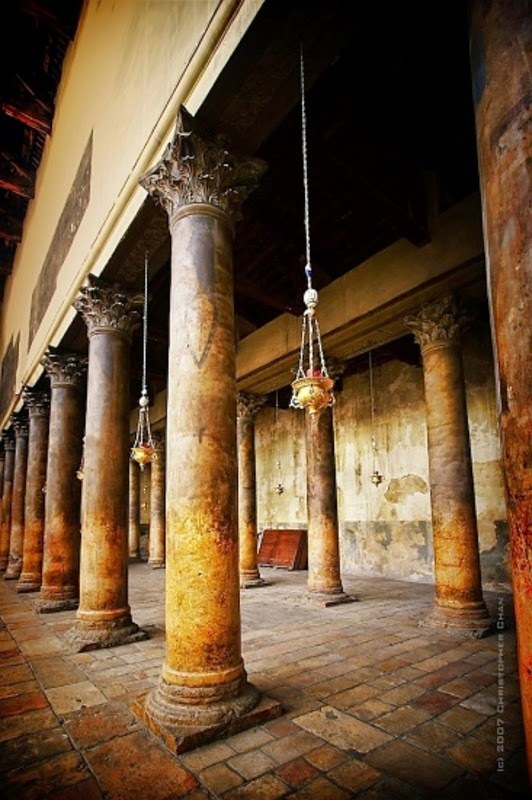 It gives the illusion that there is a room beyond the tabernacle, the wall being the door to it. Were the tabernacle just sitting on top of this pleasing stone plinth, it would not have anywhere near the impact of this arrangement. It would have been even more effective had more colour been used : it seems rather monochromatic. The tabernacle itself is of beautiful proportions and form. This Shrine does not attempt to give the impression of an altar : there are no cloths on the plinth, nor candles upon it, nor crucifix. It is simple, attractive, noble and worthy of its sacred purpose. 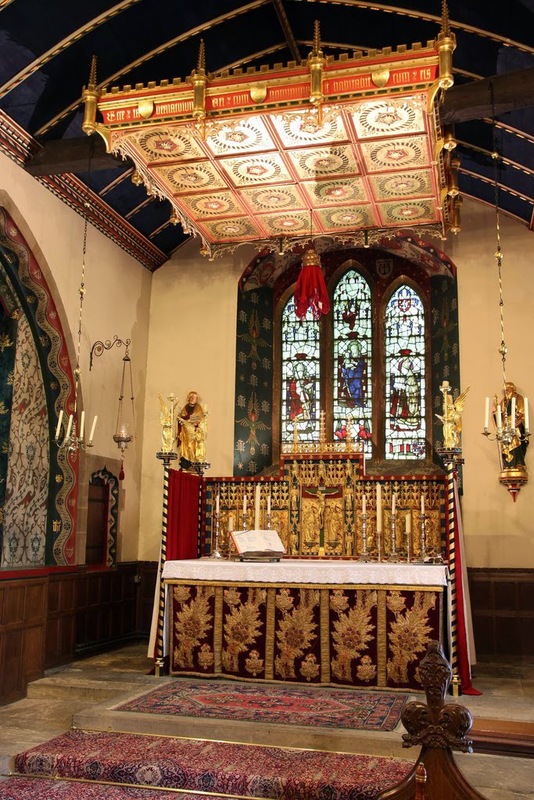 Chancel of the Anglican church of Saint Wilfrid in Cantley (UK). tester suspended above, being an English form of the altar canopy. continuation of the reredos, whilst not being obscured by it. In this post, we look at a further example at what is described as The English Altar which, as the name suggests, has its origins in England when that fair isle was still Catholic. These are a mediaeval variety of High altar, but also found in small chapels within churches or domestic oratories etc. Meeting examples of English altars, we find that the altar was typically clothed in a rich frontal but, lacking a gradine or step upon the altar table, the candlesticks (often only two) rested directly upon the altar. Sometimes a rather low reredos abutted the altar, whilst at each corner there was a post or small column. Usually angels surmounted the four posts. 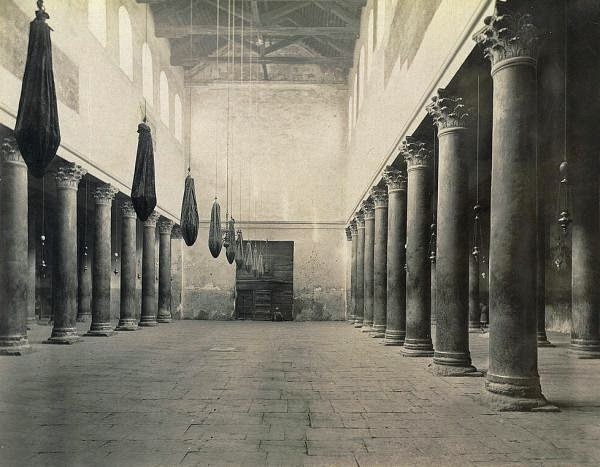 Curtains, known as riddels were suspended on either side of the altar, between the posts. These posts are held to be the survival or remnant of that early period when altars in England were covered with a civory or ciborium. The beautifully carved, polychromed and gilded reredos, the work of Sir Ninian Comper. The Crucifixion is the central motif, being flanked by angels. On either side may be observed small statues of saints. 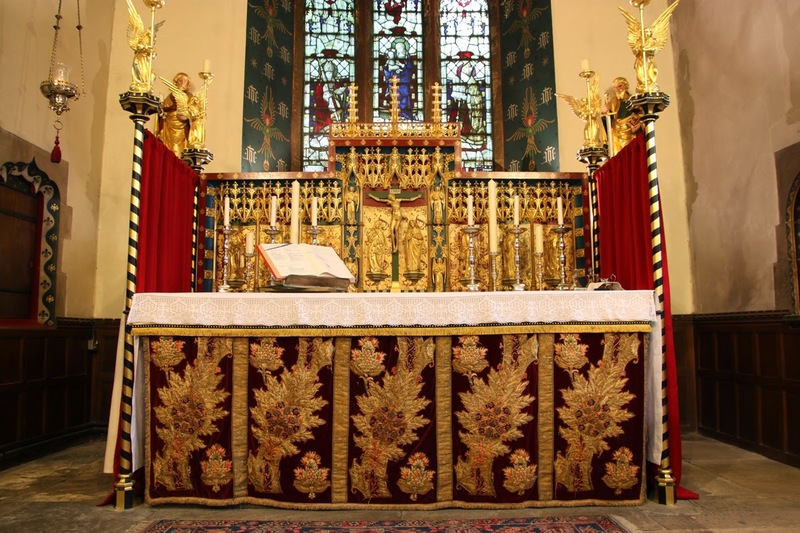 In the nineteenth and twentieth centuries, the English altar underwent a revival, mainly in Anglo-Catholic churches. But they also came to be employed in Catholic churches (we have previously seen an example from Downside Abbey). 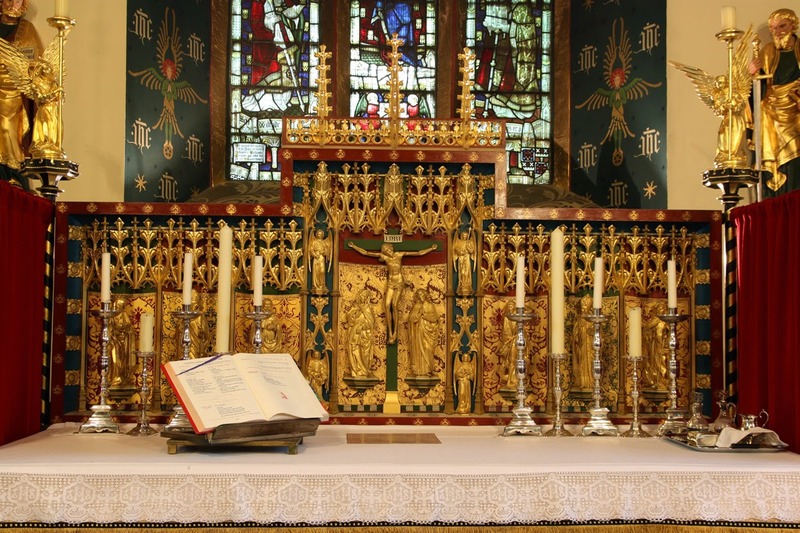 In Anglican circles, a foremost exponent of this style of altar was the renowned architect Sir Ninian Comper, who was the designer of the furnishing and decorations depicted in this post. We may qualify the above by observing that the Gothic period in England covered several centuries, during which time no one style of altar could claim to be "Gothic". A magnificently embroidered altar frontal of dark red velvet. Its appearance is cheapened by the ubiquitous strip of lace obscuring the superfrontal. 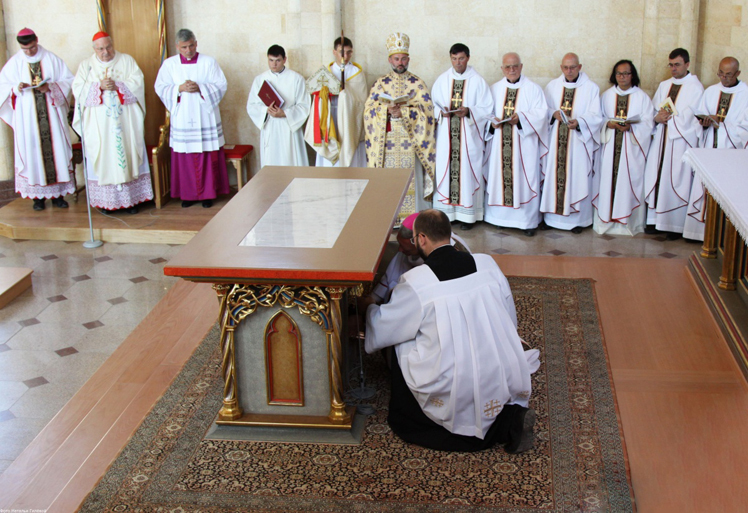 Although this form of altar is not common in Catholic churches, there is no reason why it could not be, even in a more simplified form. 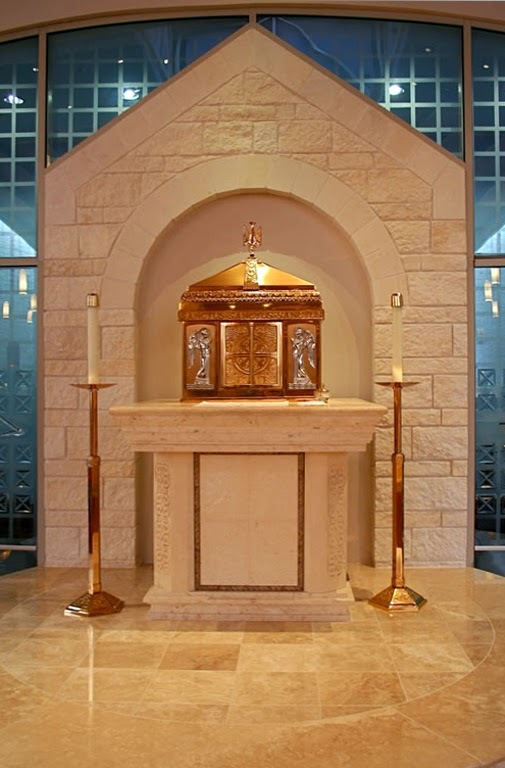 There are examples of such altars where a tabernacle is placed centrally. We shall continue to present examples of such arrangements in further posts. The above photographs were taken from the following flickr site, where many more marvellous photographs of this church may be seen. Apse of the Karaganda Cathedral. 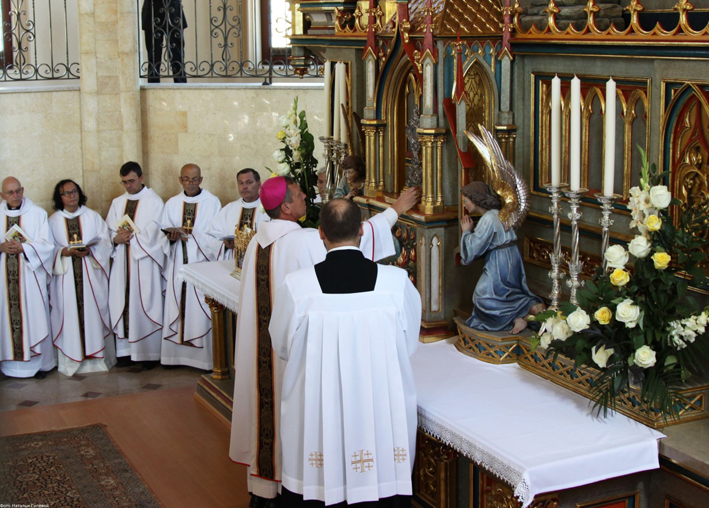 In 2012, the Diocese of Karaganda, in Khazakhstan completed and consecrated its new Cathedral in honour of Our Lady of Fatima, Mother of all Nations. What appears to be an historic altarpiece has been installed as the High altar and focal point of the Cathedral. It is an extremely impressive ensemble visually, constructed of timber, polychromed and gilded. and appear almost as one unit. 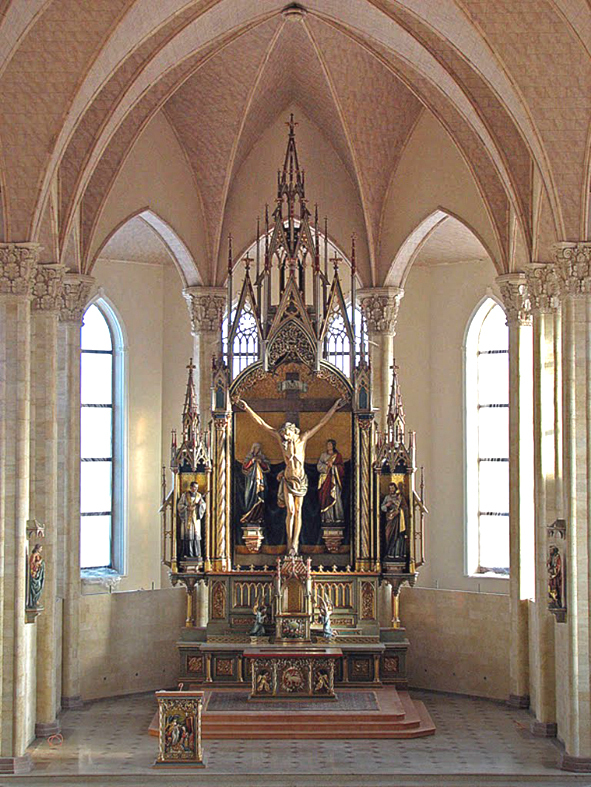 Standing in front of the High altar is another altar, freestanding. A timber altar, with rather beautifully done carving, is the altar at which Mass is intended to be celebrated. But it is not fixed: it sits on a splendid carpet at the same level as the High altar, and the whole thing could readily be moved out of the way. But this altar was consecrated and a rather ingenious method of construction was then revealed. Approximately two-thirds of the mensa was a slab of marble, incised with consecration crosses and set into the timber table of the altar. There is ample historic precedent for such an arrangement, which was referred to in mediaeval times as a superaltar. Beneath the mensa was placed a small house containing the sacred relics (see image below). The large marble stone set into the mensa of the freestanding altar. According to the old Pontifical, such an arrangement was not permitted for an altar, but the revised Ritual Books are more flexible. The General Instructions of the Roman Missal no. 263 says: According to the Church's traditional practice and the altar's symbolism, the table of a fixed altar should be of stone and indeed of natural stone. But at the discretion of the conference of bishops some other solid, becoming, and well-crafted material may be used. The Ceremonial of Bishops and the Code of Canon Law restate this instruction. Thus, it is not uncommon and perfectly licit, for a consecrated altar to be made entirely of wood or metal, and sometimes, as in the case of the Karaganda Cathedral, a stone mensa is supported by a structure of timber or metal. Detail of the High altar shewing the patina of the old paintwork. This flexibility is surely an advantage when there is an existing High altar intact in a Church, but yet not usually the altar at which Mass is offered. How often do we see churches with two altars sitting one in front of the other? Usually, the two sit in uncomfortable proximity to each other, vying for attention. But not at Karaganda. Congratulations to those who devised the ingenious solution. A relic house about to be placed beneath the freestanding altar. shewing the two altars appearing as one harmonious unit. Please note that the images are the copyright of the Diocese of Karaganda. 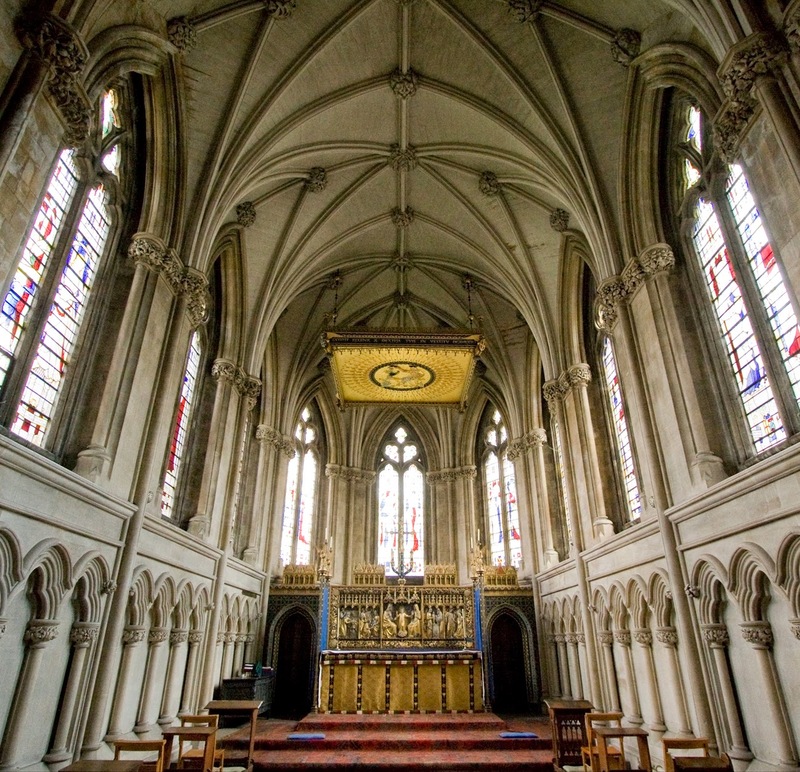 The Lady Chapel of the Abbey-Church, Downside (UK). was the work of the renowned English architect Sir Ninian Comper. The altar, by its manner of decoration, is the obvious focal point of this beautiful chapel. 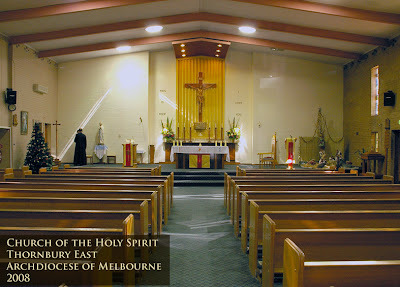 The photograph was taken by a friend of the Saint Bede Studio, Father Lawrence Lew OP. 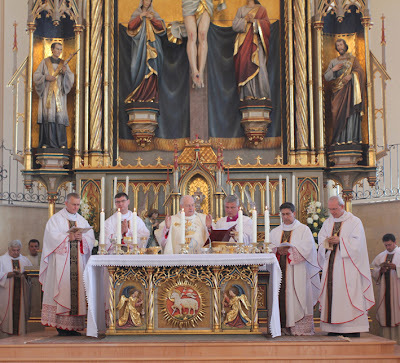 Astonishingly, in recent decades, as a manifestation of faulty understandings of the nature of the Mass, sanctuaries have been re-arranged (or built anew) to make THREE or more focal points : the altar, the "president's" chair and the ambo. Such an arrangement is a complete innovation, having no precedent in the history of the Church's liturgy and architecture. 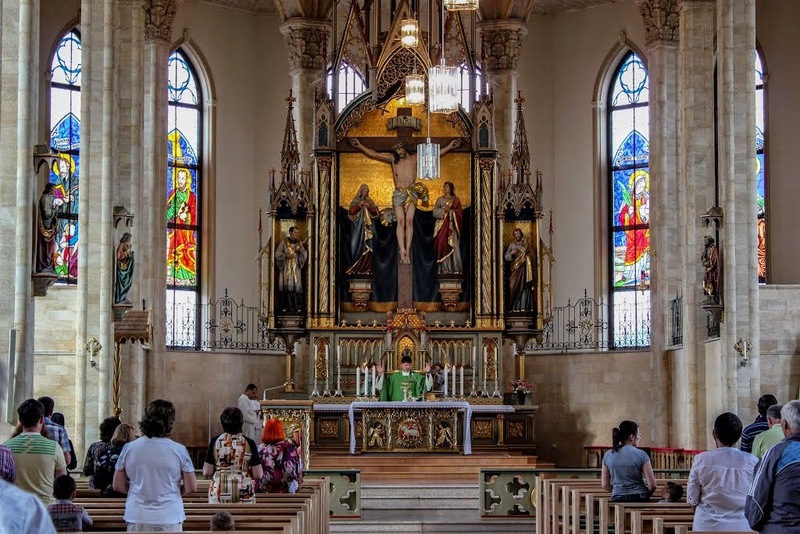 Such arrangements have done, in fact, positive harm in the name of liturgical purism : they have skewed the Faithful's understanding of the Mass and created spaces not of worship, but of obscure novelty. The creation of a variety of focal points for the furnishings of the sanctuary, none of which is aligned with a central axis. The ugliness of this arrangement can only destroy recollection of the sacred. 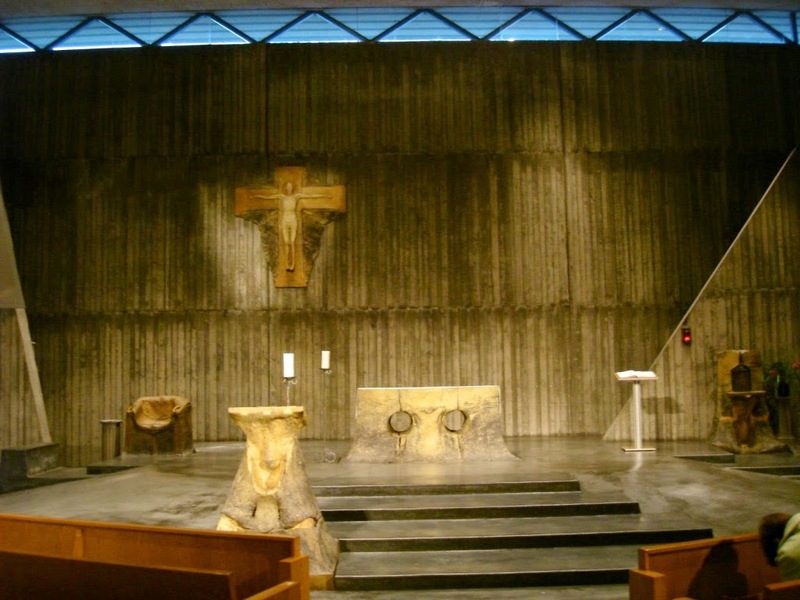 Catholic Student's Chapel at the University of California, Berkeley USA. The consecration of the altar and the church, which sets them apart permanently for the purposes of divine worship, is the primary reason for the sacredness of a church. Consequently, the notion that removing the Blessed Sacrament from view somehow makes it permissible to stage concerts and other secular events within a church is misguided. Canon A. Croegart, The Mass: A Liturgical Commentary (vol. one), 1958, pp. 4-5.
of the transepts and beyond this the apse. A precious jewel set in the small town of Avenas, situated between Cluny and Lyon in eastern France, is the church of Notre Dame. It is said to have been built in the twelfth century, but maybe as early as the ninth century. The inclusion of pointed arches at the crossing seems to indicate that this Romanesque building was constructed at the transition to the Gothic period. 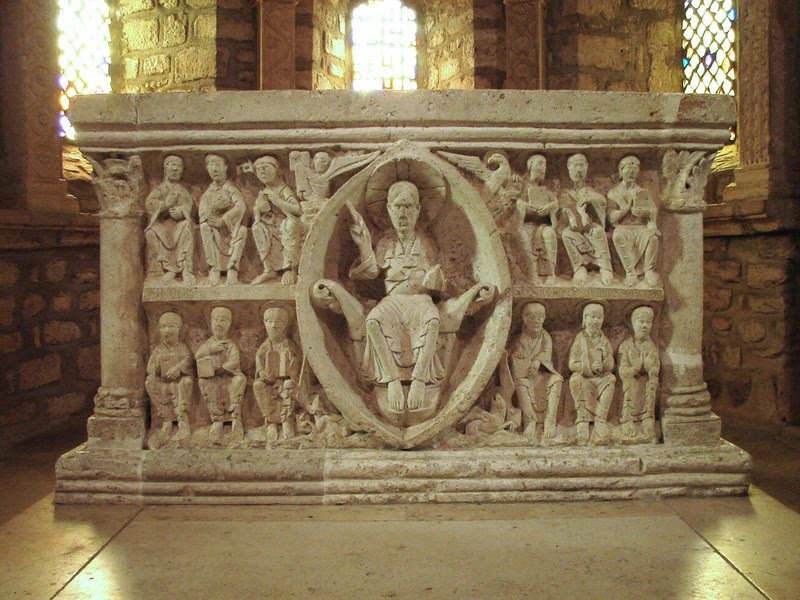 This noble church is famed for its extraordinary limestone altar (certainly of the twelfth century), depicting Christ enthroned in majesty amid the Apostles and Evangelists. This marvellous and dynamic carving forms the frontal-piece of the altar. The freestanding altar of carved limestone. 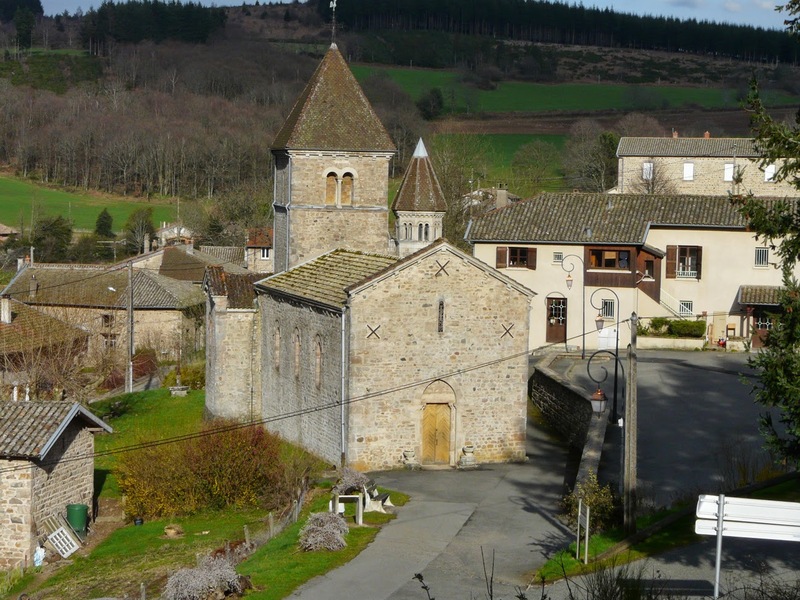 has survived in this small church for 900 years. The following is adapted from Vergnolle "Maiestas Domini Portals of the Twelfth Century" in Romanesque art and thought in the twelfth century. The theme of the Maiestas Domini, Christ seated on a throne surrounded by the four symbols of the evangelists (the lion S' Mark, the eagle S' John, the ox S' Luke and the angel S' Matthew) refers to the Final Day of Judgement and the omnipresence and power of God. The theme became popular all over Europe by the heyday of Romanesque art by the end of the eleventh century/ beginning of the twelfth century. 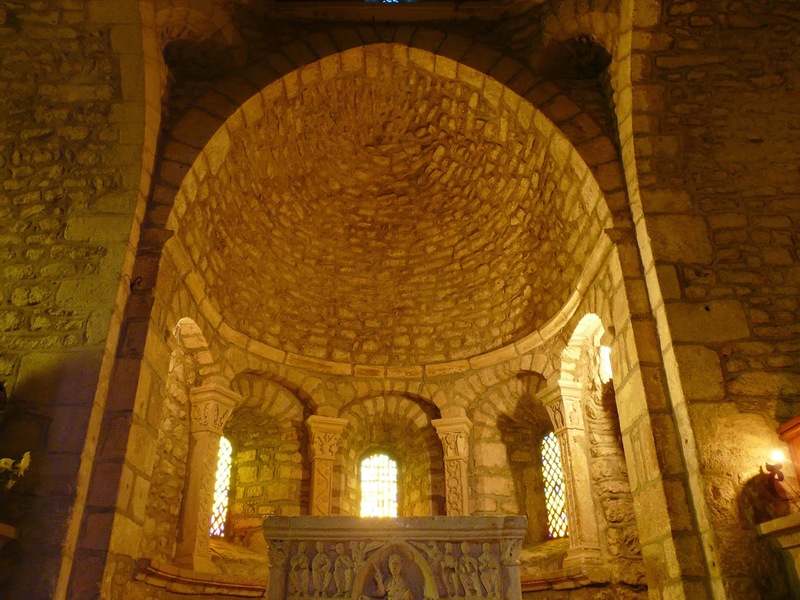 The mandorla (or vesica) of the Romanesque period, the oval frame covering the theme, replaced the circular halo of light or almond from previous times. On many Romanesque altar frontal-pieces, the Maiestas Domini occupies the centre of the composition, framed by the apostles, and has a direct relationship with the liturgy. 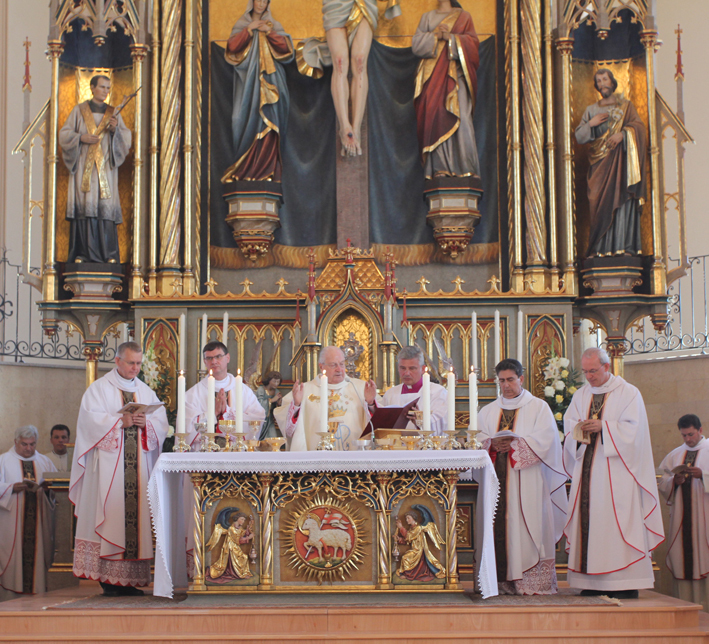 It was to the Divine enthroned Majesty that the Church presented the Eucharistic sacrifice and its hopes for mankind. 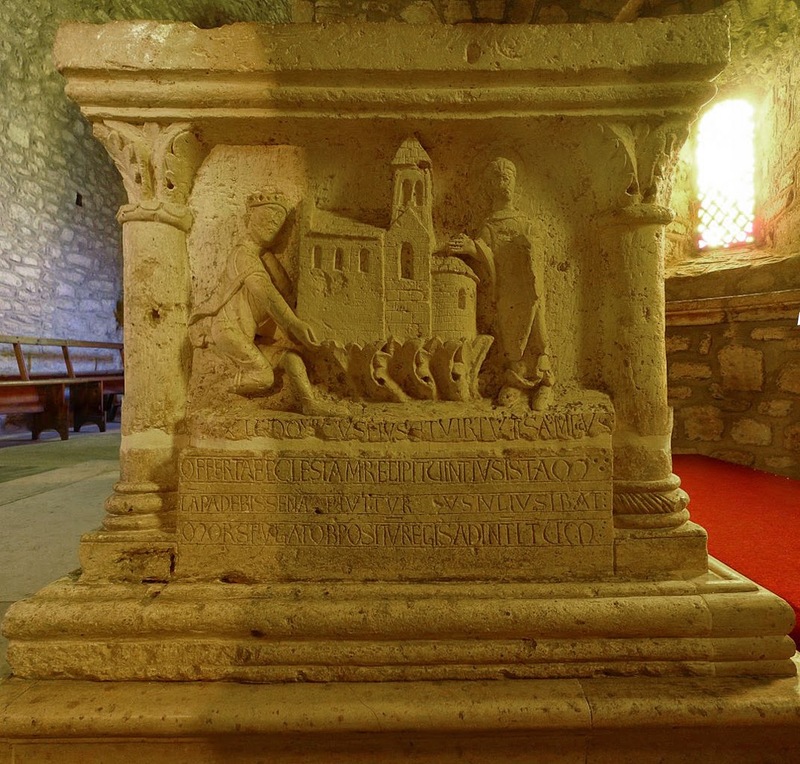 One of the most precious examples is the altar of Notre-Dame in Avenas. “Rex ludovicus pius et virtutis amicus offert ecclesiam. Recipit Vincentius istam. Lampade bissena fluxurus Julius ibat. Mors fugat obpositum Regis ad interitum”. The freestanding altar stands in its ancient position at the opening into the apse. 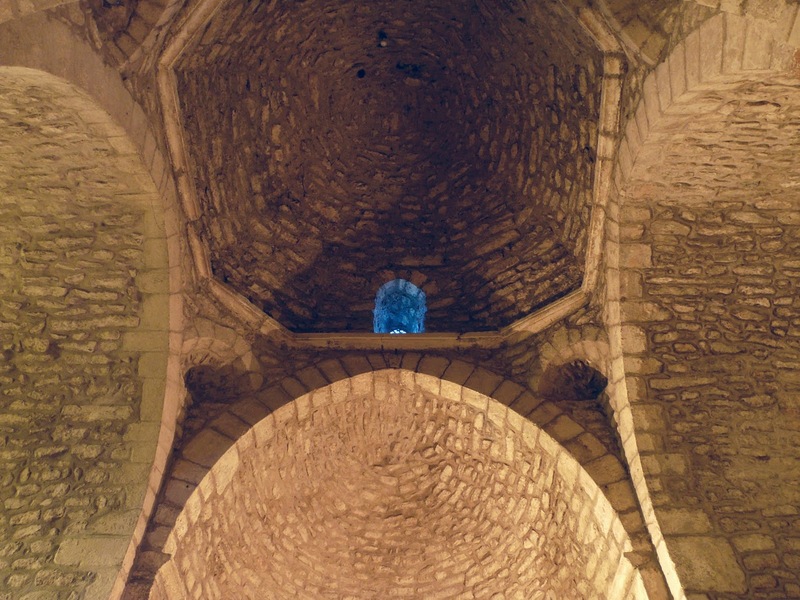 Undressed stonework vaults the apse, which is lit by three simple round-head windows. 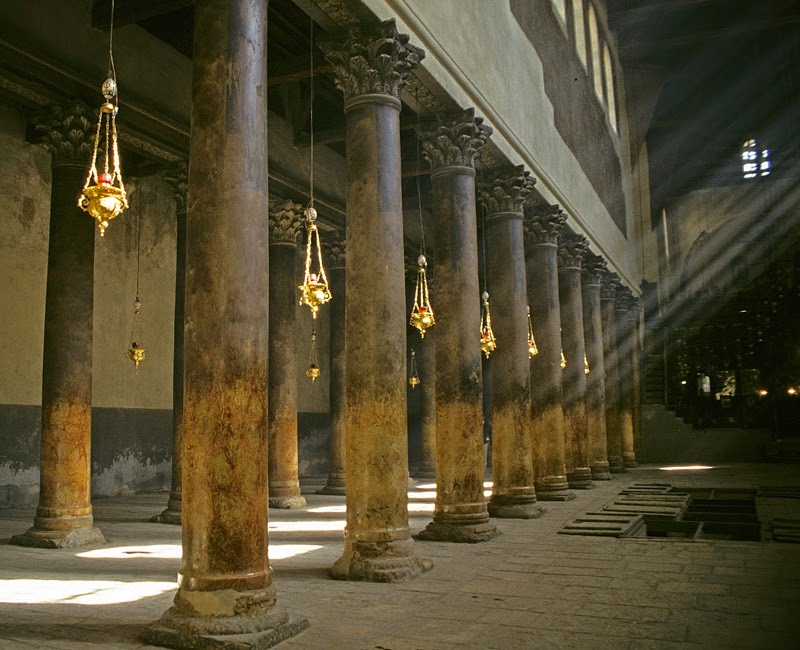 by four splendid stone columns, each carved differently. Looking up into the dome surmounting the crossing. The exterior of Notre Dame Avenas, a witness to the Faith for almost a thousand years. The design is simple, but noble. A tower surmounting the crossing adds much dignity to this rural church. A smaller adjacent tower, abutting the southern transept, is octagonal in shape and has much more detailing. It appears to be a later addition. The photographs illustrating this post have been taken from this source. Frequently, through the riches of the worldwide web, beautiful images of churches are to be found. Some are grand, some inspiring and some are ... charming. This photograph of Saint Mary's Anglican Church in Moorcourt, Herefordshire (UK) was found here. 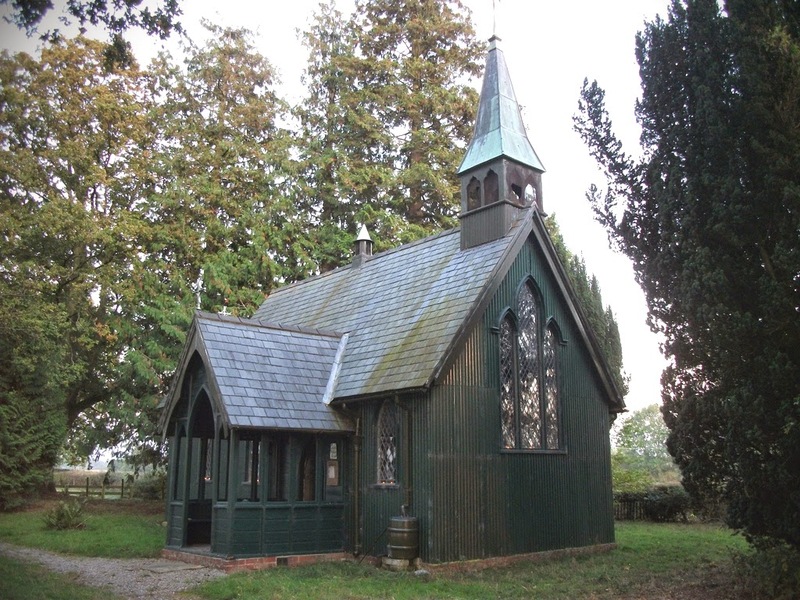 Built around 1865, this small timber-framed church had its exterior walls clad in corrugated iron, which is presently painted a deep green. It has a small, separate chancel, which is not quite visible in this photograph. Simple it might be, but the proportions and detailing are all very good. Detailing is all carried out in imitation of the stonework of her grander cousins. Church-building is an expensive and daunting concern. 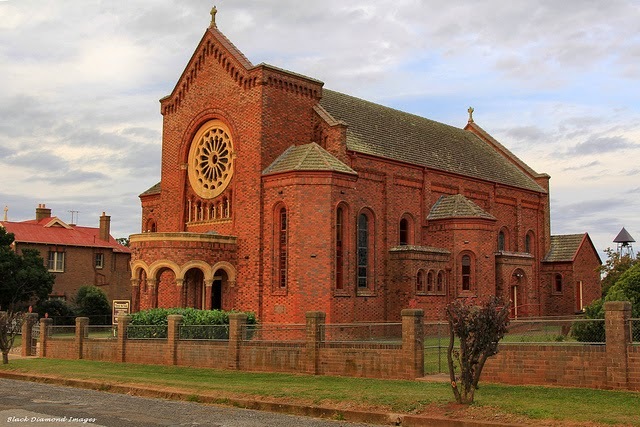 Although this is an Anglican church, we wished to include it here to illustrate that beauty can be created on a small-scale, even with modest materials. But good proportion and detail are everything. Please note: The above copyrighted image may not be reproduced in any circumstances. The magnificent Benedictine Abbey-Church of Saint Andrew in Bruges, Belgium is completely intact and truly glorious. 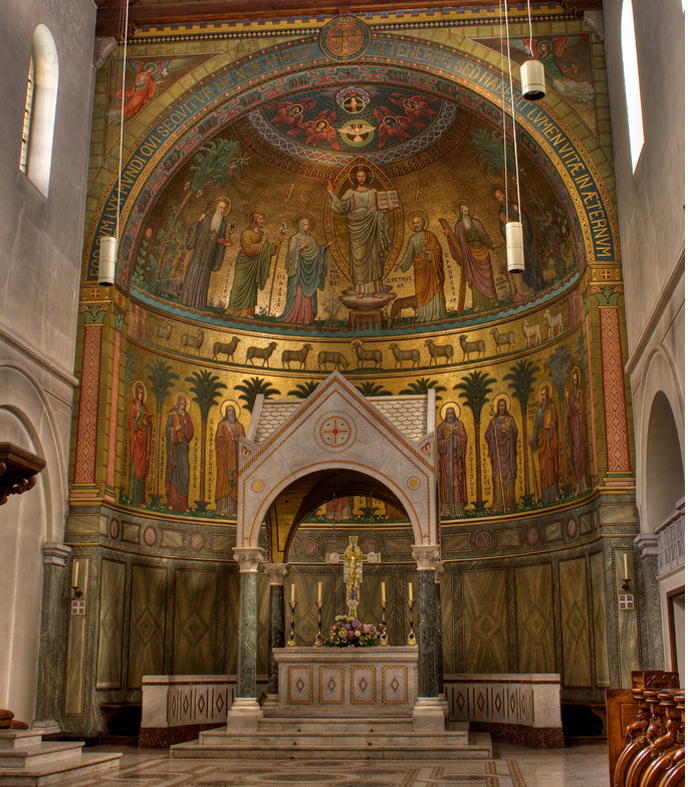 The altar rests beneath a magnificent civory or ciborium, the vault of which is covered with golden mosaic tiles. The apse walls are treated with inlaid marblework and murals painted in the Beuronese school of sacred art. 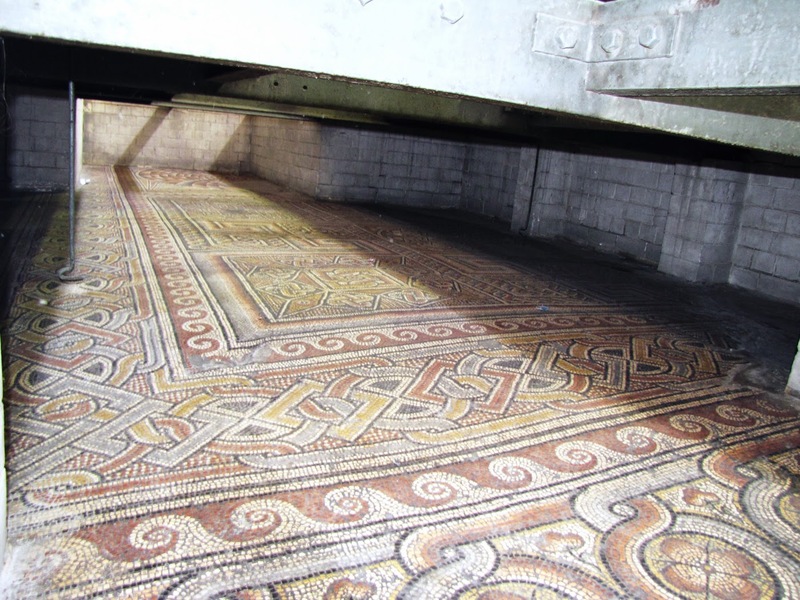 Equally magnificent is the Cosmatesque floor of the sanctuary. 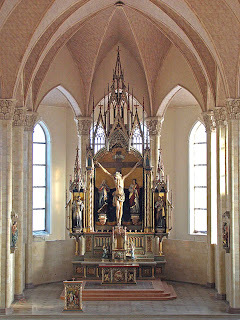 The altar of Saint Joseph in the Abbey-Church. Here is seen a further example of the Beuronese school of sacred art. beautifully detailed and admirably proportionate. Belgium around 1960. 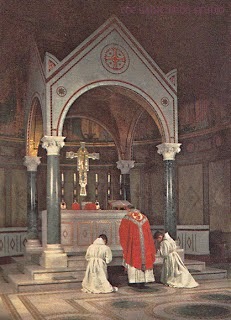 A Benedictine monk is pictured at the beginning of a Low Mass, attended by two servers. 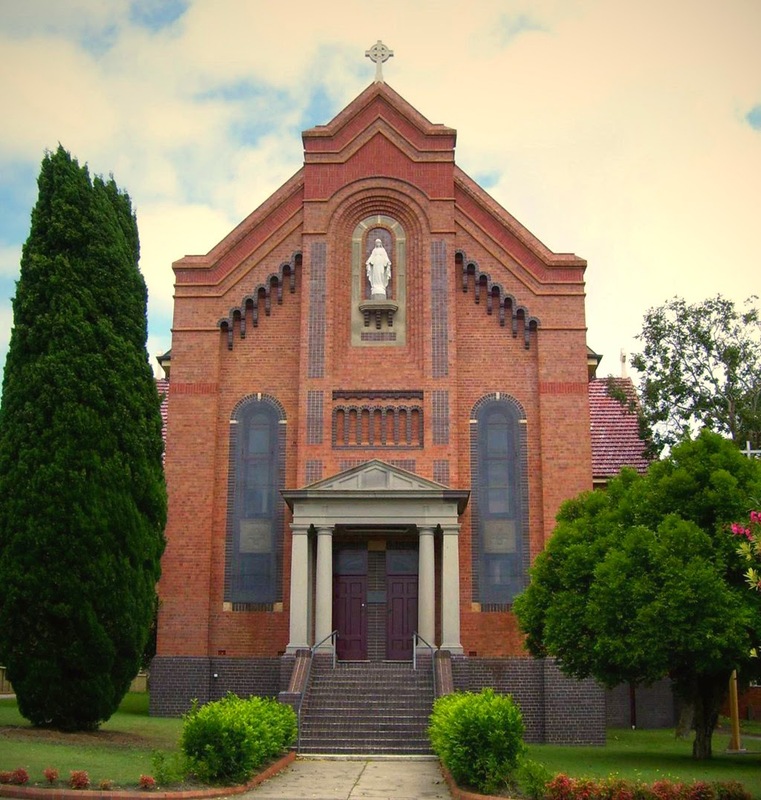 A more detailed description of the Church, with photographs, will be the subject of further posts. 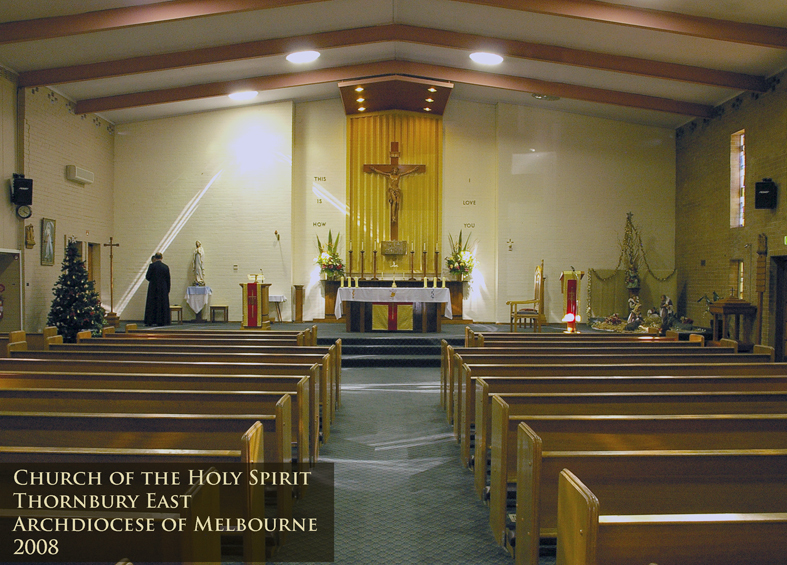 Some years ago, the then Parish Priest of East Thornbury (Archdiocese of Melbourne) approached the Studio to design some modest improvements to the aesthetics and liturgical arrangements of the Parish Church, within the constraints of a very small budget. 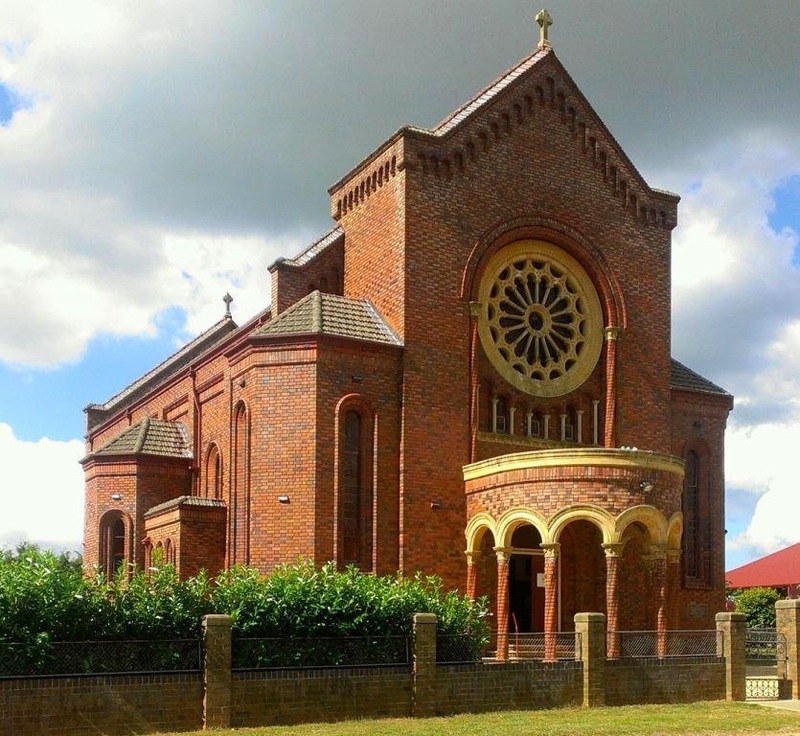 Built in the 1960's, the East Thornbury church cannot be said to embrace any particular architectural style. The building is rectangular, wide, the ceiling is rather low; the interior walls partly rendered and painted, partly exposed brick. The sanctuary is part of the main structure, rather than a separate space, although well-elevated on steps. 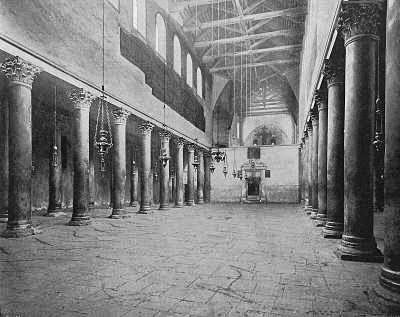 Visually, the principal difficulty was that the sanctuary appeared a small and ill-defined area within a much larger space and not the focal point of the church, as it ought to have been. The original timber High altar had been dismantled, but its components re-used. A new treatment of the reredos was crucial to the success of the work to enhance the church visually. A brick reredos, painted a subdued yellow, was located in a slightly-recessed wall. The recessed wall was painted anew in a burgundy colour, whilst the reredos was changed from yellow to an ivory colour; this ivory colour was also used for the repainting of the sanctuary walls. Flanking the recessed wall, decorative work was carried out along the full height of the sanctuary wall, and framed by a new structure of timber. This work effectively expanded the width of the reredos and made it appear more three-dimensional. A timber panelwork dado - a remnant of the removed High altar - was modified, reducing its ungainly width to correspond to the width of the altar. 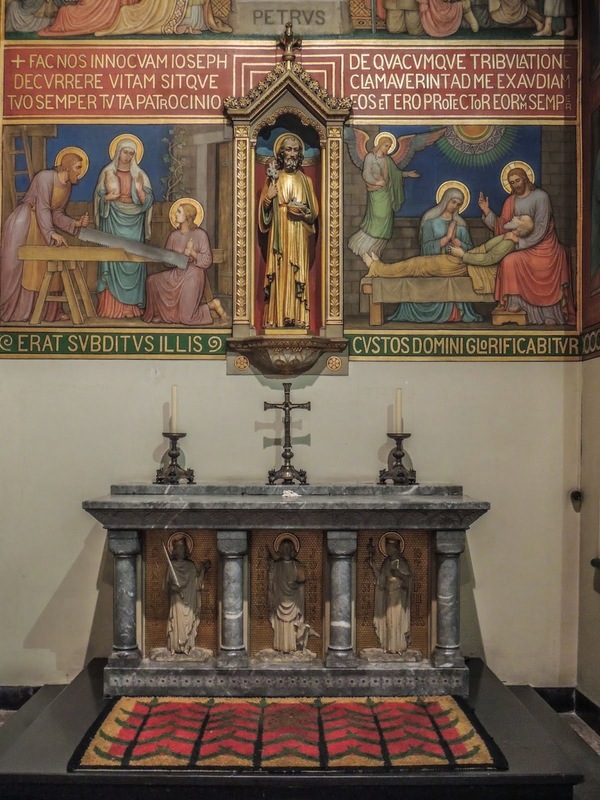 Lastly, a peculiar arrangement whereby the tabernacle was embedded into the brick reredos at the foot of the prominent Crucifix was changed by lowering the tabernacle to be contiguous with the panelwork. A partial re-instatement of the High altar timber predella (altar step) took place on which the altar was placed. Carpet was removed from this section of the sanctuary floor and parquetry was installed. The altar was re-sited to be directly beneath the tester or canopy which was part of the original High altar arrangements. This allowed the altar to be illuminated by lights in the canopy. A feature wall running the full-length of the building was of untreated brick. In association with the installation of timber posts to demark the sanctuary visually from the nave, the sanctuary section of that feature wall was painted ivory-white, along with the adjacent sanctuary walls. 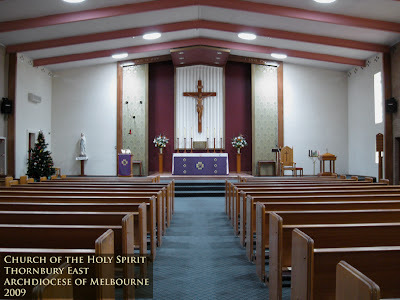 In making recommendations for the redecoration of Holy Spirit Church, Thornbury East, the Saint Bede Studio made no attempt to impose a pseudo-Classical or pseudo-Gothic makeover. 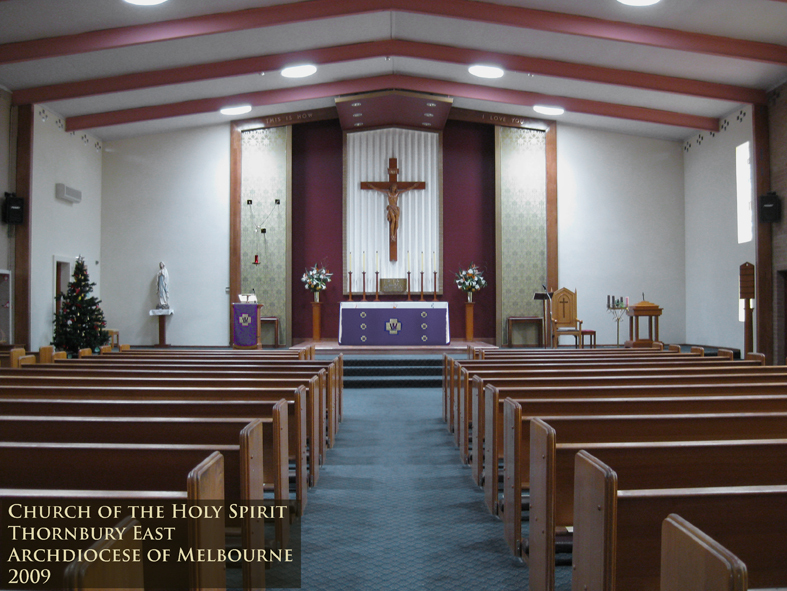 Instead, a simple treatment which enhanced the liturgical appointments of the building was successfully carried out. The two photographs above, shewing before and after, illustrate everything described above. Welcome to this new Blog, which is intended to be a different facet of the work of The Saint Bede Studio. Here will be presented observations on Catholic architecture, particularly as it pertains to the Sacred Liturgy and its aesthetics. Sometimes posts will be presented of the Studio's own work in this area. Restoration and re-ordering work that is going on unabated in our churches worldwide will also be discussed here (not all of it favourably, of course), in addition to new churches which we come across on the cornucopia of the world-wide web. Our beginning here is very simple, but perhaps will improve as we go along, ad majorem Dei gloriam. Please visit again.